I'M BACK!!!! !I'm finally back after 2 weeks missing. US had been great and I would say that it was the most memorable, fun trip I ever been to out of the many trips I went in my life. I went to remarkable places and met up with people from different walks of life. What I experienced was something so precious that no tours or tour guides could offer. Right now you're about to have a taste on my journey so enjoy! After 36 hours waiting and being on planes, my dad and I finally arrived in Ithaca, New York where my mum had been waiting and boy, were we whipped out with the plane ride. 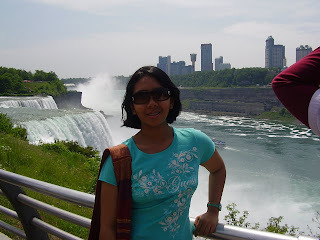 But our jetlagness did not stop us from driving for 4 hours to Niagara Falls in a rental car. And my dad almost went to jail. Wanna know why? He was issued a ticket from the police for speed driving. He was brought directly to see the judge and it was either he pays the fine or he goes to jail. Of course he paid the fine as he didnt want to be Paris Hilton cell mate. LOL! Niagara Falls was magnificent. If before this I only seen it in movies like Superman II but this time I was there for real, seeing the whole thing and feeling the splashes of the waterfall on my face as we cruised along the river with the Maid of the Mist boat ride. 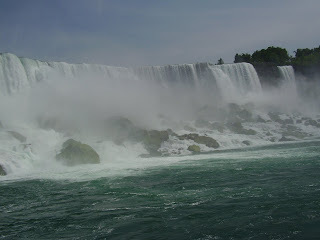 From the boat ride, you could see both sides of US as well as Canada as it was the border between Ontario and New York. Next up was my favourite city in the world, NEW YORK CITY. We went there with a bus which took us about 5 hours. 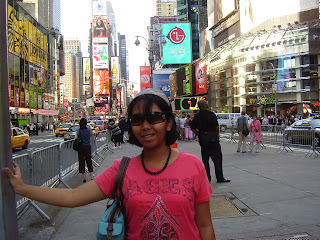 It was my first time in New York City since my last visit 7 years ago. There was something about the city that made my adrenaline pumped harder than usual. New Yorkers were known as unfriendly people who just didn't bother about the surroundings as they continue their paces in the metropolitan city. At least that was how the New Yorkers were portrayed in movies and books. But there were some friendly people like this 1 guy who helped me with my bags while I was trying to carry it up the steep stairs of the Subway. We only stayed in NYC for a day as we had to catch a 13 hours train ride to West Virginia. Yeah, 13 hours. We stayed over at Nancy's, my mum's friend. I really like her as she was very well-read and witty. She's a Professor (Chairperson) in 1 of the unis in Parkersburg. I learned a lot of stuff from her from gays to French revolution to the economic growth of West Virginia. The next day, Nancy drove us to Columbus, Ohio to attend another of my mum's friend wedding reception, Evan. Now, this reception ain't like the typical white wedding you normally see in movies. Instead, the reception was held in a camp called Camp Mary Orton. Very different. 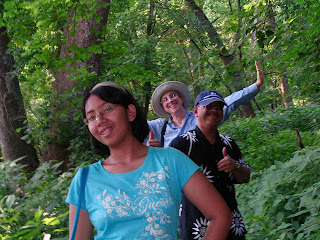 We went on a river trail and met up with Evan and his relatives and friends. After the reception, we walked around Columbus. It was a nice city. We had dinner at a Japanese restaurant, Haiku. We finished dinner at about 9pm and we wanted to see more of Columbus but unfortunately the shops would normally close at 9pm. But there was this one particular shop that was still opened, Torso. They sold 'interesting' stuff that no shops would sell like 'PMS breath mints' and others (I wouldn't name them) and it turned out to be a gay shop! We only realized that after Nancy saw a brochure in the shop promoting gay parade or something that was gonna be held next week. Interesting. I would continue my post another time as I coudn't possibly fit my 2 weeks trip under 1 post. Stay tuned for more East Coast moments!